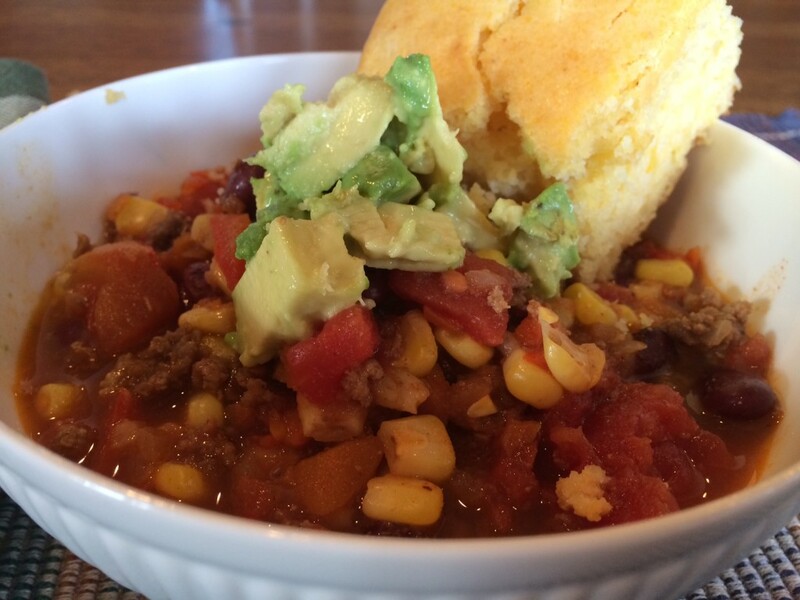 Finished Chili with avocado garnish and corn bread. In our house, it is still a struggle to get the boys to eat most veggies. I have found, however, that if I can serve them a big, hearty bowl of stew where the vegetables are not the first ingredient that jumps out at you, then I can get much less push back. Spaghetti sauce and chili are two amazing opportunities to sneak in some veggies. 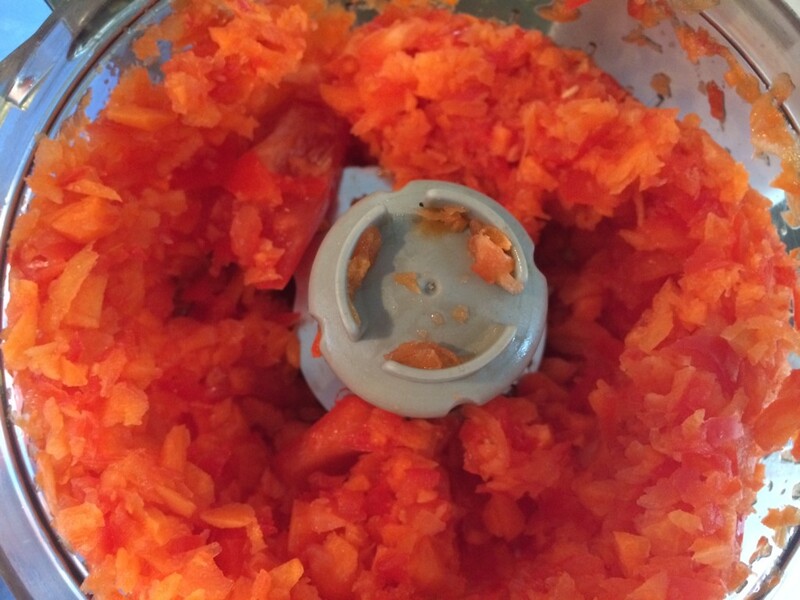 Both have the tomato base which allows me to hide finely chopped (When I say fine chopped, I really mean pulverized in a food processor.) carrots, onions, garlic and red peppers within the yummy meat and beans. Veggies before they hit the food processor. Veggies after being ground in food processor. As you can see from the pictures above, this sneaky buffalo chili allows me to pack in a lot of veggies with no protest from the boys. Both the carrots and the red pepper are extremely high in Beta Carotene, the precursor to Vitamin A, which is important for vision, healthy immune systems and cell growth. Red peppers are powerhouses in Vitamin C, an incredibly important nutrient for immune health. It can also lower blood pressure, and is a powerful antioxidant which protects our bodies from free radicals. 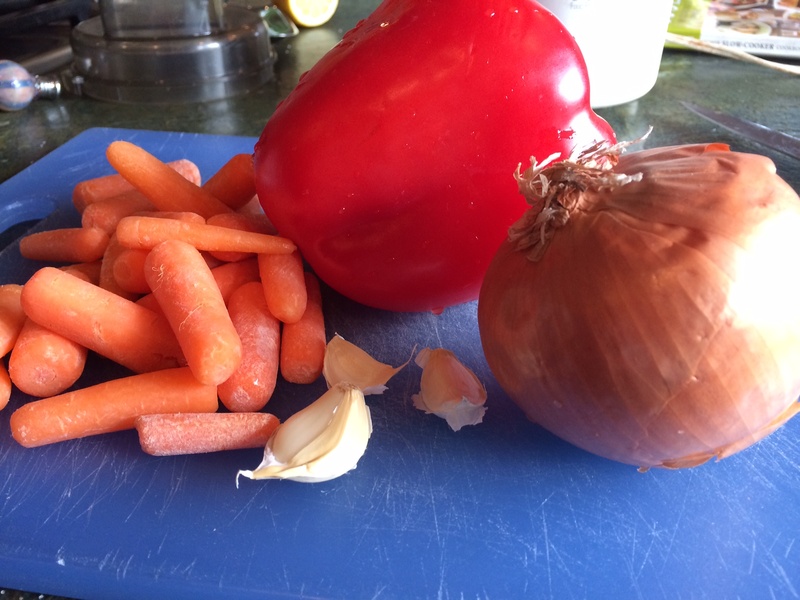 The tomato base also supplies healthy doses of Beta Carotene and Vitamin C.
All the veggies and buffalo cooking on the stove. 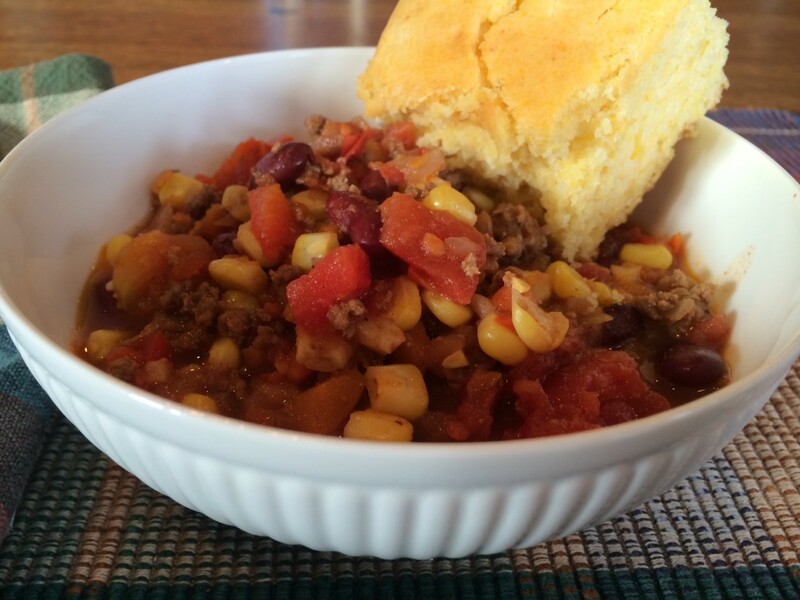 The goodness in this chili does not stop with all the packed in veggies. 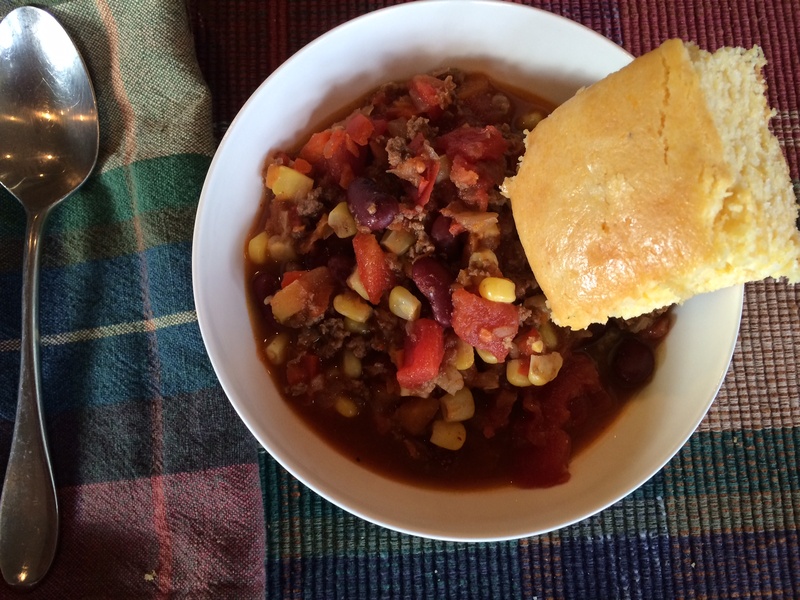 Instead of using a traditional ground turkey or ground beef for the base of this chili, I used bison or as it is commonly called, buffalo. Buffalo has an incredible 34 grams of protein per pound, It is significantly lower in fat, calories and cholesterol than both beef and turkey. It has more iron than beef, an important nutrient for the blood oxygen delivery system. (If your blood is iron deficient you will start feeling tired, pale, irritable and listless.) Buffalo is also a significant source of B vitamins which are important for energy and provides good doses of zinc and selenium. Currently, most buffalo in the US is grass fed which leads to higher concentrations of inflammation fighting Omega-3s than feed lot produced beef. Buffalo has a similar taste and look as ground beef so it is an extremely easy substitution in chili, stews, hamburgers and other foods where you would traditionally use ground beef. 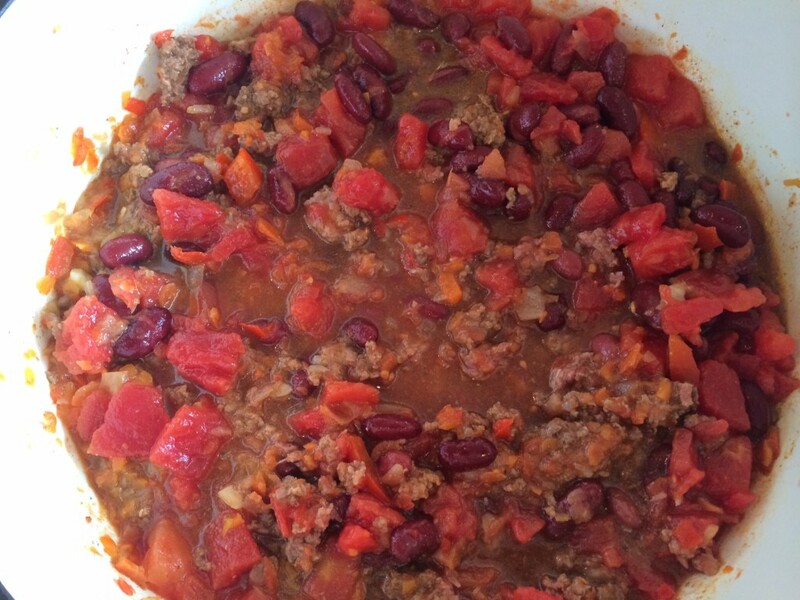 You can feel great about serving this very healthy chili and your kids or other veggie resistant people in your life will never realize they are getting mega doses of protein, zinc, Vitamin A, Vitamin C and B vitamins. They will be too busy asking for seconds. This post appeared on Skip to My Lou’s linky party.